The venue of the conference is the beautiful Amritapuri campus of our University, which is nestled in the picturesque village of Vallikavu beside the scenic backwaters of peninsular India. 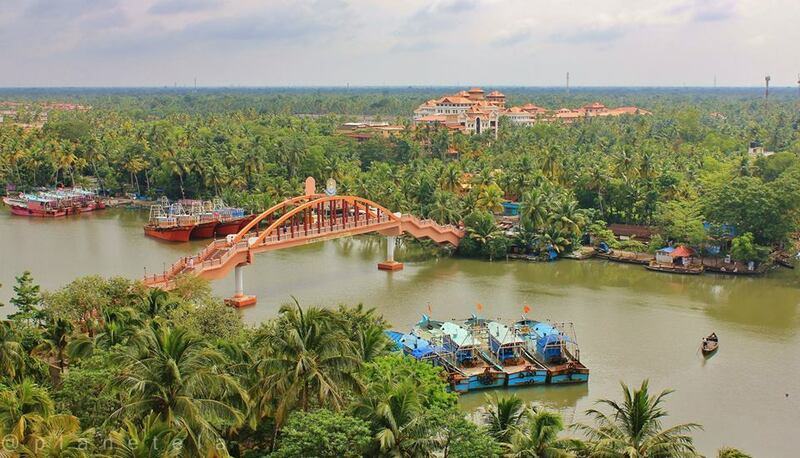 We offer a wonderful and stimulating ambience with endless stretches of coconut palm groves and the Arabian Sea that borders Kerala on the west only a few hundred meters from the campus. By Air and Taxi: Kochin (Kochi) International Airport at Nedumbassery is situated 140 kilometres north of the campus. One can ask for a pre-paid taxi to Amrita University, Amritapuri. The taxi-ride costs about Rs. 2,500 and takes about three hours. By Train: Kayamkulam is the closest train station situated 12 kilometres north of the campus. After disembarking, one can hire an autorickshaw to come to the campus. The ride costs about Indian Rs. 220 and takes about 20 minutes. Buses are also available from Kayamkulam Bus-Stand to Vallickavu Junction, which is about a five-minute walk from the campus. By Bus: From the Ernakulam Transport Bus-Stand, one may board a bus going towards Trivandrum via Alappuzha, and alight at Ochira. From Ochira, an autorickshaw can be taken to bring one directly to Amritapuri, which is 6 km away from Ochira, at a cost of about Rs. 80 Or one may board a bus going to Vallickavu Junction, which is about a five-minute walk from the campus. By Air and Taxi: The closest airport is Trivandrum (Thiruvananthapuram), located 110 kilometers south of Amritapuri. One can ask for a pre-paid taxi to Amrita University, Amritapuri. The taxi-ride costs about Rs. 2,500 and takes about three hours. By Train: Karunagapally is the closest train station situated 10 kilometres south of the campus. After disembarking, one can hire an autorickshaw to come to the campus. The ride costs about Rs. 200 and takes about 20 minutes. Bus service is also available from Karunagapally. at the southernmost tip of peninsular India, and the confluence point of three oceans – the Bay of Bengal, the Arabian Sea and the Indian Ocean. It is renowned for its exotic sunrises and sunsets over the horizon. There are two rocks reaching out of the ocean, one is the Vivekananda Rock and the other the Thiruvalluvar Statue. Regular ferry services make it possible for tourists to reach these two places. Another important attraction is the Gandhi Memorial, built on the spot where the vase consisting the Mahatma’s ashes was kept for public viewing before submersion. Kanyakumari is about 189 kms from Amritapuri. is a beach town on the Arabian Sea. Three crescent shaped beachesalienated by rocky outcroppings and covered by fertile coconut palms, form the major attraction of this coastal resort. Shallow waters stretching for hundreds of metres are ideal for swimming. It is also renowned for its several Ayurvedic salons, and recuperation and regeneration resorts which provide a wide variety of Ayurvedic treatments for tourists. Kovalam is about 111 kms from Amritapuri. labelled as the Venice of the East, is blessed with beautiful backwaters washed by the silvery waves of the Arabian Sea, palm fringed canals, shores bustling with glimpses from the day-to-day life in the country side, the mirror still lagoons and picture book lakesides make Alleppey one of the best backwater tourism destinations. You can cruise these backwaters from Amritapuri to Alleppey. The distance by road from Amritapuri is about 60 kms. is an enthrallingly beautiful backwater destination located on the picturesque Vembanad Lake. Glimpse the amazing shades of green of the vegetation that include mangroves, coconut palms, and paddy fields that cover the verdant countryside as you take a boat cruise; the ideal way to travel across the channels and waterways winding their way through this green paradise. Kumarakom is about 82 Km from Amritapuri. known as the queen of the Arabian Sea, is a cluster of islands on the vast expanse of the Vembanad Lake. Some of these picturesque islands are Bolgatty, Vypeen, Gundu and Vallarpadam. The major attractions are, the Bolghatty Palace, the Chinese Fishing Nets, the Dutch Palace, Hill Palace, Mangalavanam Bird Sanctuary and the St. Francis Church. a tea town is a breathtakingly beautiful picturesque hill station in Kerala’s Idukki district and located at the confluence of the Muthirappuzha, Nallathanni and Kundaly rivers. Sprawling tea plantations, picture book towns, winding lanes, trekking and holiday facilities make Munnar a unique experience for the tourist and traveller. Munnar is about 228 kms from Amritapuri. The Athirapally Falls, an 800 foot high waterfall, one of the most bewitching sights to onlookers, is at the entrance of the Sholayar ranges. Combined with the greenery, it infuses freshness into any tired soul. Vazhachal is a picturesque spot just a short drive from Athirapally and is adjacent to dense green forestland. Both the waterfalls, their cool, misty waters cascading down in the backdrop of thick green forest and rocky terrain, are a scintillating experience. Athirappally is about 198 Kms from Amritapuri. Delegates are requested to make their own hotel reservations directly with the hotel of their choice in the Amritapuri area. Hotels listed have offered a courtesy discount for Bioquest2013. Discount codes will be provided when you register for the conference. We will also provide transportation between venue and hotel.